A versatile chain that can be used for a wide variety of applications. 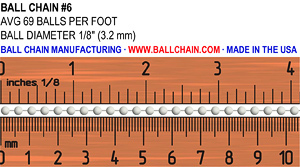 The #6 chain has a diameter of 3.2 mm or 1/8". These chains can be used as pull chains for lights and ceiling fans, as retention chain for items such as pens, filler and dust caps, tags, NAS parts, and assemblies. It is also used as larger and stronger key chains, necklaces, identification chains (id chains), law enforcement badge holders, and more. 1/8" 3.2 mm 69 18 lbs. 30 lbs. 45 lbs. 20 lbs.